Identity and Dialect Performance discusses the relationship between identity and dialects. It starts from the assumption that the use of dialect is not just a product of social and demographic factors, but can also be an intentional performance of identity. Dialect performance is related to identity construction and in a highly globalised world, the linguistic repertoire has increased rapidly, thereby changing our conventional assumptions about dialects and their usage. The key outstanding feature of this particular book is that it spans an extensive range of communities and dialects; Italy, Hong Kong, Morocco, Egypt, Syria, Japan, Germany, The Sudan, The Netherlands, Nigeria, Spain, US, UK, French Guiana, Colombia,and Libya. "This far-reaching book offers a range of global perspectives on dialect and identity. At the heart of Identity and Dialect Performance: A Study of Communities and Dialects is a contemporary understanding of dialect as an intentional performance of identity. This postmodern perspective throws many conventional assumptions and "truths" around dialect and identity into question and places the discussion of dialect at the intersections of class, race, ethnicity, geography, gender, and religious belief within a globalized, mediatized, and networked world. […] Overall, this excellent and fascinating book draws on a wide range of sources to give the reader a breadth of knowledge in relation to current social-linguistics and dialectology. […] These contemporary studies have the potential to influence the approach to teaching dialect to actors in a way that suits the contemporary pluralist setting." "Identity and Dialect Performance affords an original vantage point from which the nuanced intersectionality and dynamism inherent in research on dialectology and sociolinguistics can be championed. 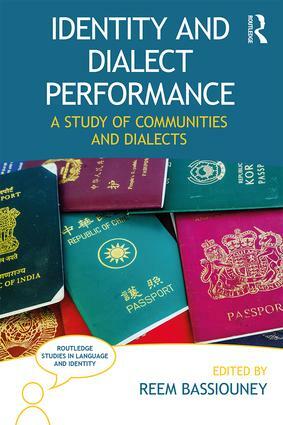 The result is a compendium of studies on how dialect performance and linguistic choices are linked to identity construction through metalinguistic discourse in a comprehensive range of communities. This collection also celebrates methodological eclecticism through a wedding of qualitative and quantitative methods to yield maximum insights into manifestations of dialect performance and the process of identity construction." "An excellent book, it is indispensable for those researchers and students concerned with the role of dialect in the performance and negotiation of social meaning. Its publi-cation will surely prompt further equivalent research in other contexts." 6. Darija and the construction of "Moroccanness"
Reem Bassiouney is Professor of Linguistics at The American University of Cairo. Her recent book publications include Functions of Code-Switching in Egypt (2006), Arabic Sociolinguistics (2008), Arabic and the Media (2010, editor), Arabic language and Linguistics (2012, co-editor), Language and Identity in Modern Egypt (2014), and The Routledge Handbook of Arabic Linguistics (forthcoming, co-editor).